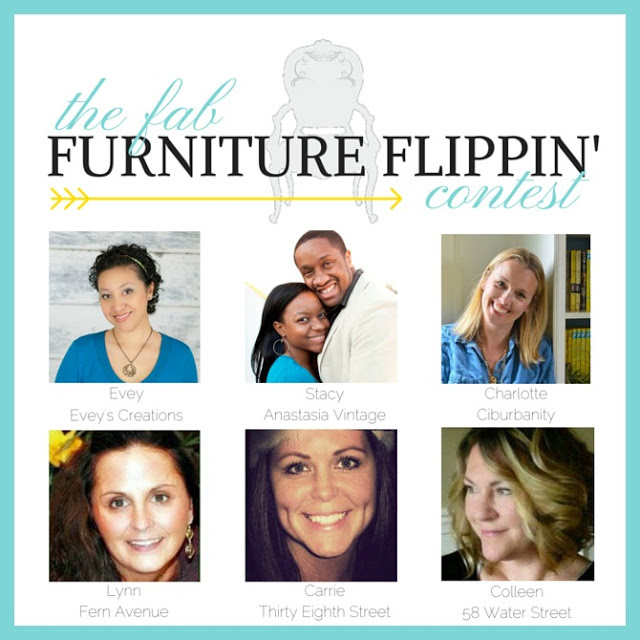 I was so excited this month to get to work on my Fab Furniture Flippin Contest #FFFC entry. The theme for February is “Make a Statement”, and the piece chosen had to truly stand out. What better way to do that than by using colour? Sponsored Post Disclosure: I was not financially compensated for this post. I was provided with product by DecoArt Inc. to use for review purposes. All opinions expressed are my own and reflect my honest recommendations. 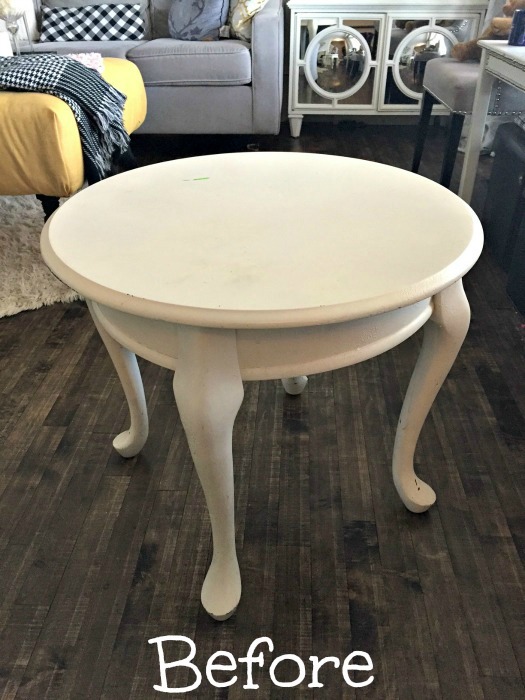 For my project, I chose to use an old side table (with some gorgeous Queen Anne legs), that had been sitting in my garage for over a year. I wasn’t sure what to do with this piece (other than having it sit under a pile of recycling in my garage, of course) until this project was put in motion. 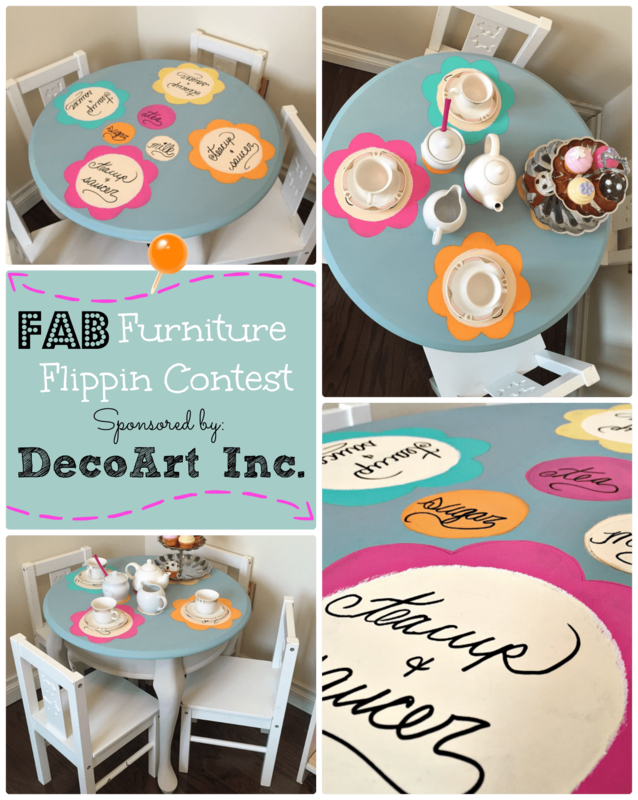 Since my 7 year old LOVES tea parties and has been asking begging for a tea party table, I thought this was the perfect chance to do something unique and fun. The colours I chose from DecoArt.Inc were Primitive and Treasure. The reason I chose these two gorgeous colours was because they could be mixed to produce a soft an subtle blue, and also can be used on their own. The tones match my personal style, so I figured it was a win-win. 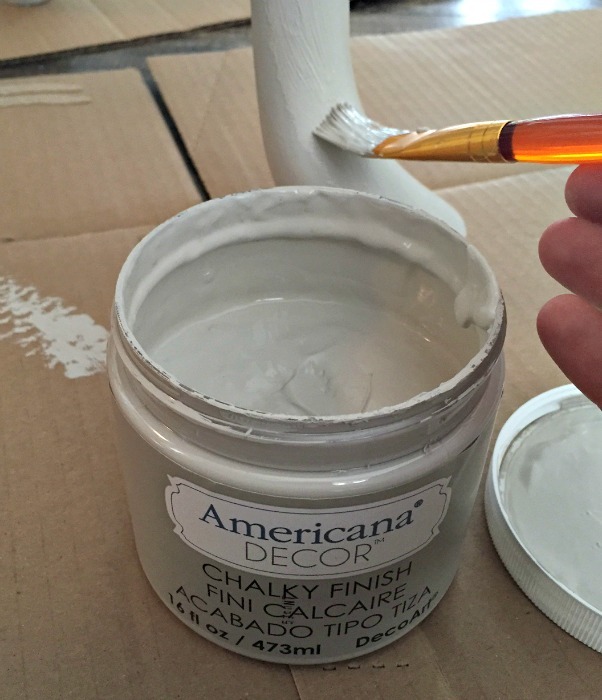 Click here to see the full colour guide of the chalky finish paint by DecoArt Inc. I also went with the Soft-Touch Varnish which went on extremely smooth, dried quickly, and is meant to stand up to all the abuse a typical 7 year old could throw at it. 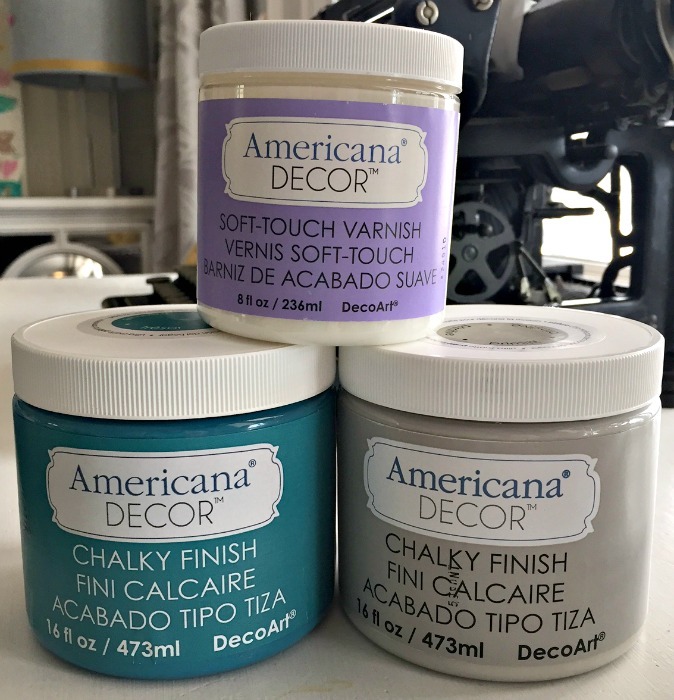 I stared off by mixing my two chalk paints until I got the right tone of blue. Next, I painted the perimeter, and then moved on to applying the paint in long fluid strokes. This paint was truly amazing to work with. It was very thick (which mean less drips and mess) and smooth upon application. 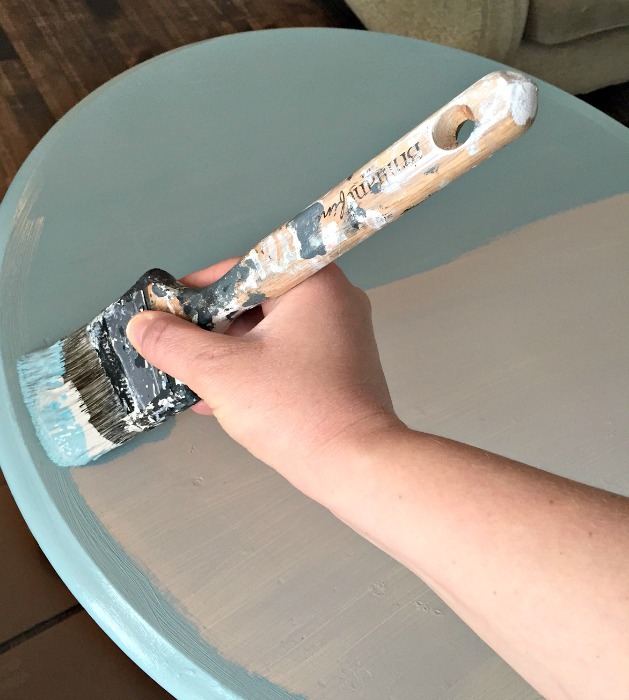 The coverage was also impressive, and I only had to apply two coats to completely cover the table. Next, I painted the legs in the Primitive (soft gray) colour. I truly LOVE this colour and think it complements the blue top perfectly. I could have left the table as is and it would have worked beautifully, but I really wanted this table to stand out, and be able to hold its own. Lol. So, I decided to use some simple craft paint to jazz it up. 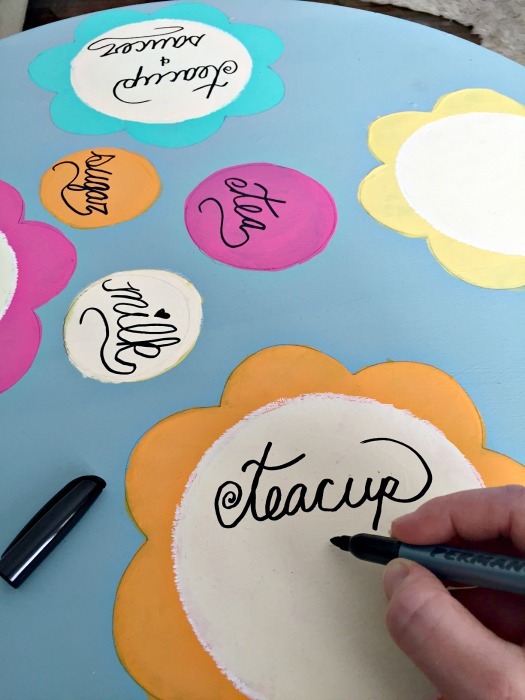 I started out tracing a kids Ikea plate on to the table where each tea party guest would be sitting. 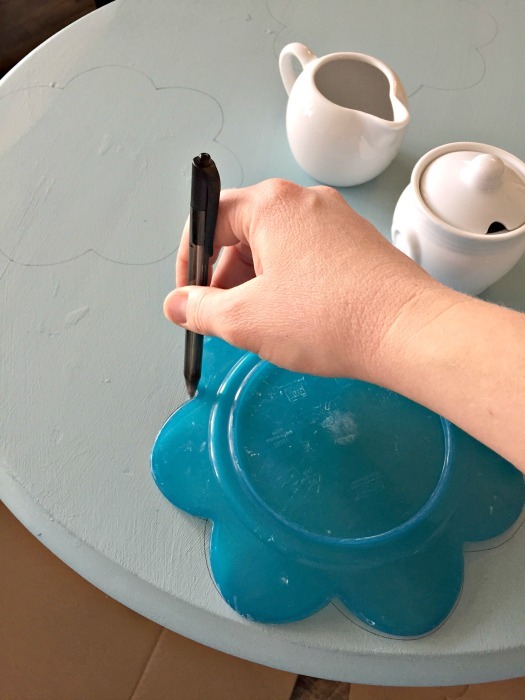 I also traced out where the milk, sugar, and teapot would go in the center of the table too. I used chalk to trace out the circles, and left the imperfect edges as they were, since it’s a kids table after all. Once all the place settings were painted, I thought it would be cute to write on each one what is supposed to be placed there. I tried by best to write as “fancy” as I could in the middle of each one. 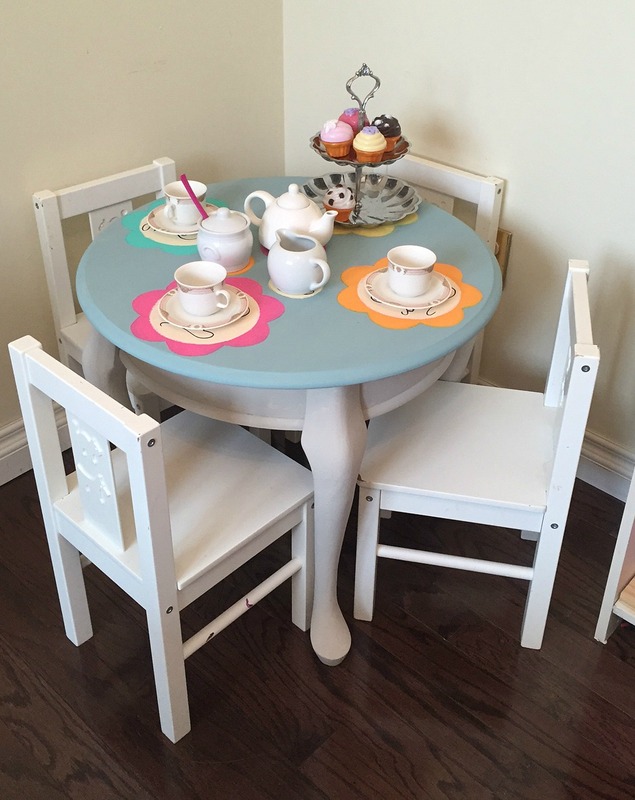 After two coats of the Soft Touch Varnish, the table was ready for its first tea party. Here is the tea party all set up. 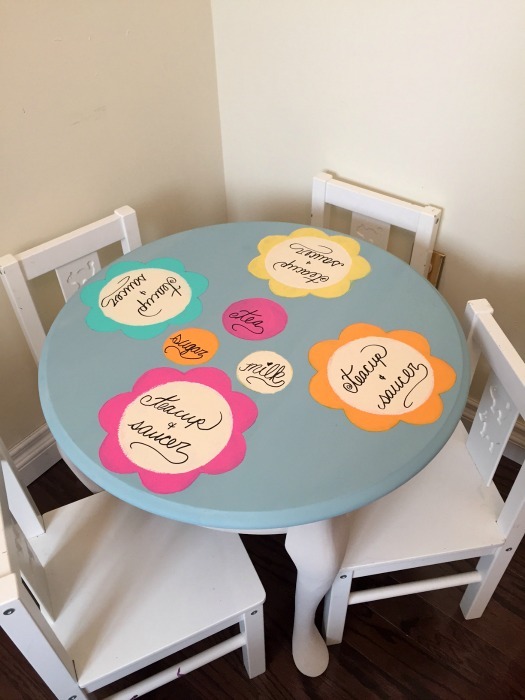 I’m loving how well it turned out and how it looks cute with a tea party all set up or simply just as a table with the fun writing on top. It certainly is one-of-a-kind. So adorable! 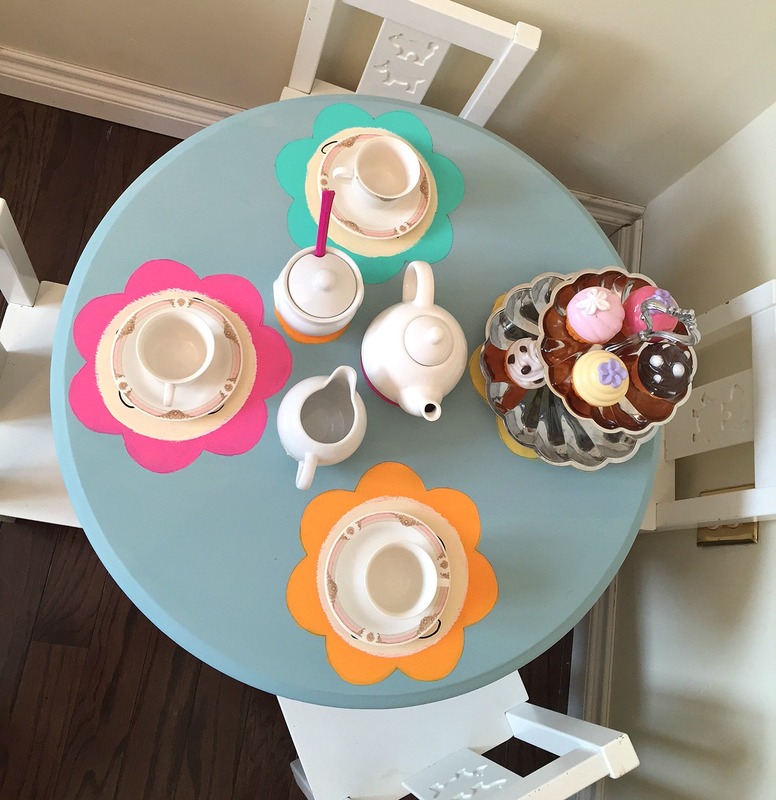 I know my girls would love it if I did this to their Ikea table…and I would too! The table is adorable. I’m sure your daughter will enjoy it for years. What an adorable makeover and great idea! I bet your daughter is loving it. 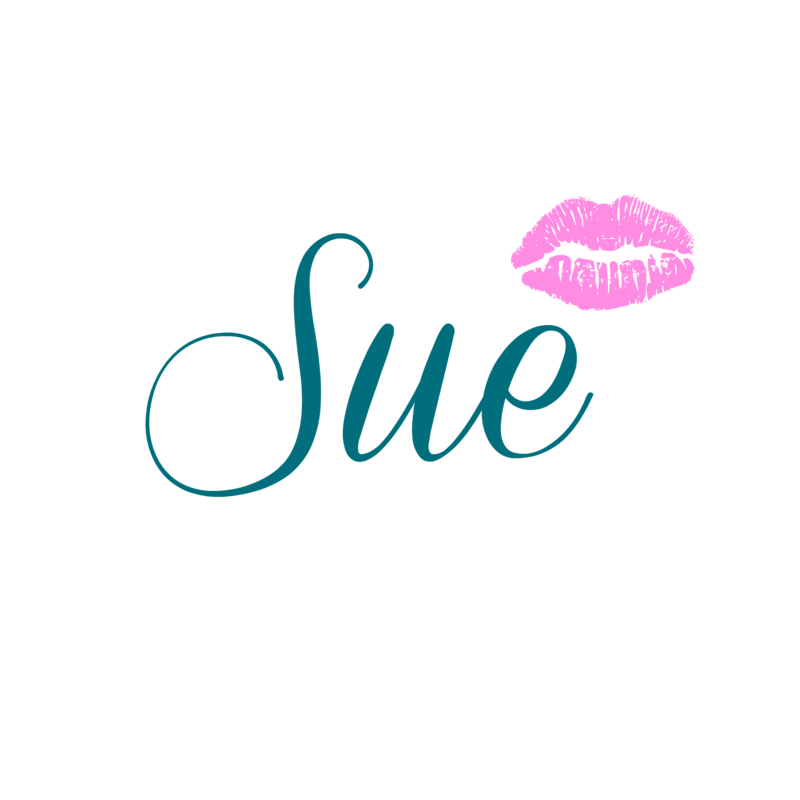 Another fabulous makeover, Sue! Thank you Karla 🙂 She’s already had several tea parties there with her stuffed toys.